SpecVet has the ability to integrate with Antech Labs, create lab requisitions and automatically import lab results with ease. 5. How to link orphaned labs to existing order*. *If there is no matching order available to choose from, the user must create a new order and manually generate invoice and other details. For each Antech orderable, SpecVet will generate a separate requisition. For example, if a user orders a CBC & a PCV that user will get a lab requisition for the CBC as well as a separate lab requisition for the PCV. 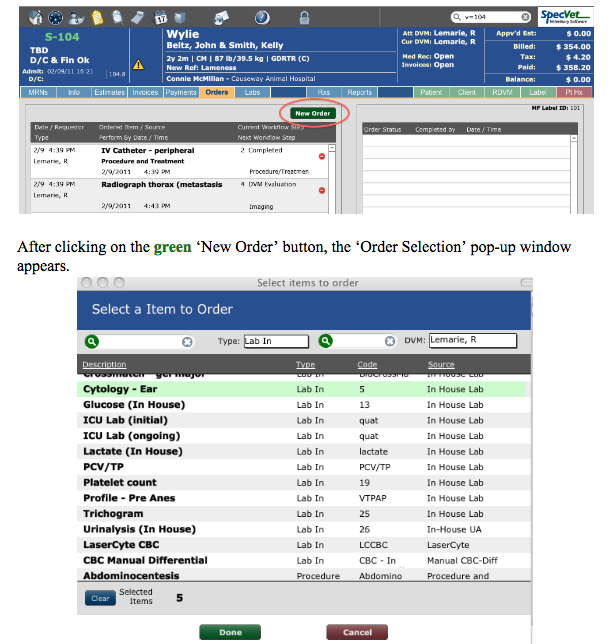 While viewing the ‘Order Selection’ window, the user can search and sort orders by description, type, order code or source, as well as choose an attending DVM. For example, when ordering Electrolytes, search for order code “lytes”. In this window the user can select either a single, or multiple Orderable Items. After selection is complete, the orderable item will be highlighted in green. After the Antech item has been successfully ordered, manually update the status to perform by clicking on the ‘Update’ logo on the right side of the Order Workflow. At the time when the Ordered Item’s status is updated to ‘Performed’, information is sent to Antech electronically and a Lab Requisition printout is created for that order. Electronic requisition data is automatically sent to the lab as well. The lab requisition printout must then be sent and/or given to the lab where the tests are to be performed and results are then derived. 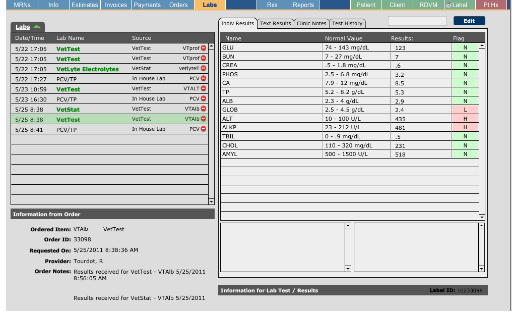 When the lab has completed generating results, they will automatically import into SpecVet. Status will be automatically updated to results received. Once an Antech orderable item has been sent to the lab, processed through the order workflow and results have been received, the order will automatically be marked as results received for the selected patient/visit. First, select the desired patient/visit to view labs. To view results, click on the ‘Labs’ tab at the top of the page next to the ‘Orders’ tab. In some situations a lab may become orphaned, meaning that lab is not linked to an order. These will show up in the orphaned labs section of SpecVet. To view orphaned labs the user must click on ‘Lab Interfaces’ from the SpecVet home screen. After clicking on the Orphaned Labs button, a pop-up window will appear. All orphaned labs for Antech are found here. 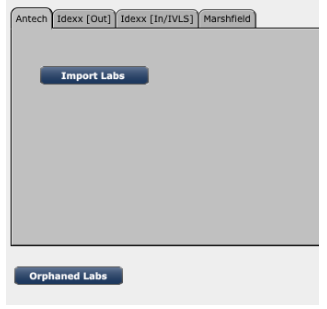 To Link an Orphaned Antech Lab to an Order from the Antech Orphaned Labs pop-up window, first find the desired Orphaned Lab by scrolling through the arrows at the top left side of the pop-up window. Once the desired Orphaned Lab has been located, type the corresponding Order number in the Order # input box. Click search. Check the visit number and other details to confirm the order number. Next, click the +Link to Order button located next to the order details to link the selected Antech Orphaned Lab to the correct Order. Next: I can't add the Order I need!